The Asian Business League of San Francisco seeks to empower Asian Pacific American professionals with a leadership role in their work place and in the community they serve. Through various seminars and workshops on topics that are relevant in the work-place in today’s business environment, we bring together our members and speakers who are leaders in their respective fields to share their experiences and know-how on leadership. The Asian Business League of San Francisco is proud to announce the return of the highly acclaimed You are the CEO of You! Leadership Program. This bi-weekly five-part series has been uniquely developed for Asian professionals, men and women, with managerial experience. Each session is carefully designed to provide an intimate learning environment for each participant – they will explore concepts and acquire the skills necessary to achieve personal and career success. The program will address unique issues and challenges confronted by many Asian professionals. At the conclusion of the program each individual will take away high impact vision statements and action plans to accelerate their careers. Classes will take place in San Francisco's Financial District and are scheduled from 6pm to 9pm. Dinner will be provided. Session 4: Tuesday,October 25 - How do I Effectively Communicate as a Leader? Session 5: Monday November 7 - What's Next for Me? Guest Speaker: Rick Gutierrez, SOAProjects, Inc.
*Please note that speakers/dates/content may change. Program fee: $495 - early bird registration rate extended to August 31, 2016. $595 - general admission after August 31. For a non-profit rate, send inquiries to info@ablsf.org. *For those working in non-profits, send inquiries to info@ablsf.org for a discounted rate. Payment: Make checks payable to Asian Business League of San Francisco, P.O. Box 191345, San Francisco, CA 94119. Program Registration: Sign up via http://bit.ly/29BSHY5. For more info, contact: ABL-SF Director of Operations Angela Pang at info@ablsf.org or (415) 691-7264 with the subject line: CEO of You. 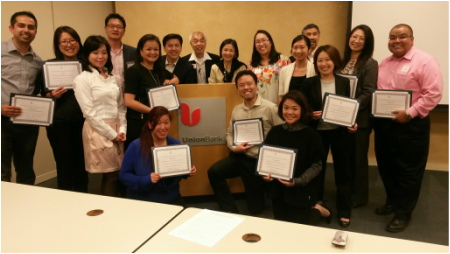 2015 Graduates of the Corporate Asian Leadership Program at Union Bank. Asian Business League of San Francisco (ABL-SF) produced its inaugural Corporate Asian Leadership Program (CALP) based off our popular leadership program You are the CEO of You! This bi-weekly, five-part seminar series took place in the spring of 2015 and was uniquely developed for the Asian American professional men and women of APSIRE at Union Bank with managerial experience. Each session provided an intimate learning environment for participants – to explore concepts and acquire skills necessary for professional career and personal success. To have ABL-SF create a program for your minimum of 10-15 employees, contact info@ablsf.org with the subject line: CALP - Your Company Name.